Roof Deck Repair. We always use the finest custom materials for your roof deck in Orange County Ca. Prestige Deck Coating inspects every roof before resurfacing and repair to make sure your deck is properly waterproofed the first time. If you are unsure if your roof deck needs repair or resurfacing, let us take a look for signs of necessary maintenance. Pooling or standing water is a sign that your roof deck is not draining properly, and this can cause long-lasting water damage. At Prestige Deck Coating, we correctly slope your deck, to be positive no water will collect on your deck. Properly sloping your deck is a necessary step in successful deck restoration. 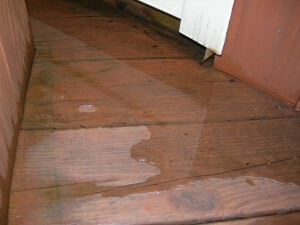 If your Orange County Ca Roof Deck Repair project has any type of stains, bubbling or discoloration this is an obvious sign that water has breached and is damaging your decking layers. Any areas with soft spots need to be repaired as soon as possible. 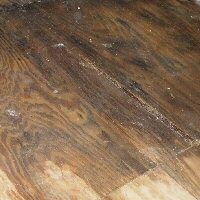 Many times the wood is saturated with water usually darker than usual, with flaky decaying features. We first restore your deck, then seal it with a two coats of polymer-modified concrete. This, combined with a layer of resin soaked fiberglass, insures a watertight seal for your roof repair project. How to Avoid Deck Deterioration? All of the signs of deck damage can be hard to spot, so be sure to contact us for a free estimate and consultation. Our deck technicians have been in the waterproofing and deck repair industry nearly 30 years. We take waterproofing and Roof Deck Repair in Orange County Ca seriously. For your own good and for your deck’s health, call your friendly neighbor roof deck repair contractors in Orange County Ca!